Some early readers of the novel have observed that viewing the world through a dog's eyes makes for a greater appreciation of being human. Why do you think this is? Enzo's observations throughout the novel provide insight into his world view. For example: "The visible becomes inevitable." "Understanding the truth is simple. Allowing oneself to experience it, is often terrifically difficult." "No race has ever been won in the first corner; many races have been lost there." How does his philosophy apply to real life? In one of the book's darkest moments, one of Zoe's stuffed animals—the zebra—comes to life and torments him. What does the zebra symbolize? Can you imagine the novel being told from Denny's point of view? How would it make the story different? In the first chapter, Enzo says: "It's what's inside that's important. The soul. And my soul is very human." How does Enzo's situation—a human soul trapped in a dog's body—influence his opinions about what he sees around him? How do you feel about the ideas of reincarnation and karma as Enzo defines them? Do you find yourself looking at your own dog differently after reading this novel? In the book, we get glimpses into the mindset and mentality of a race car driver. 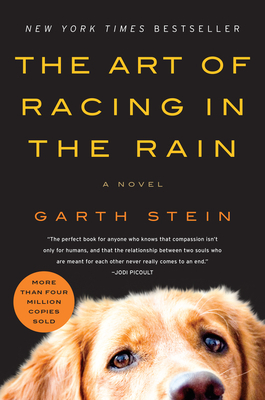 What parallels can you think of between the art of racing and the art of living? The character of Ayrton Senna, as he is presented in the book, is heroic, almost a mythic figure. Why do you think this character resonates so strongly for Denny?